The game story begins with Erina who wakes up in a cardboard box in a dark building. She realizes that something is wrong with her physical and looks nearby for a mirror. Her body has transformed from a cute bunny to a human girl and dresses like a casino bunny girl. Erin then decides the best course of action is to find her master to answer her questions. On her way to find her master she runs into a small fairy named Ribbon. After some misunderstanding, the two of them join forces and help each other out, Ribbon needs help in rescuing her friends from an evil scientist and Erin needs to find her master. The story of this game can get rather crazy pretty fast. 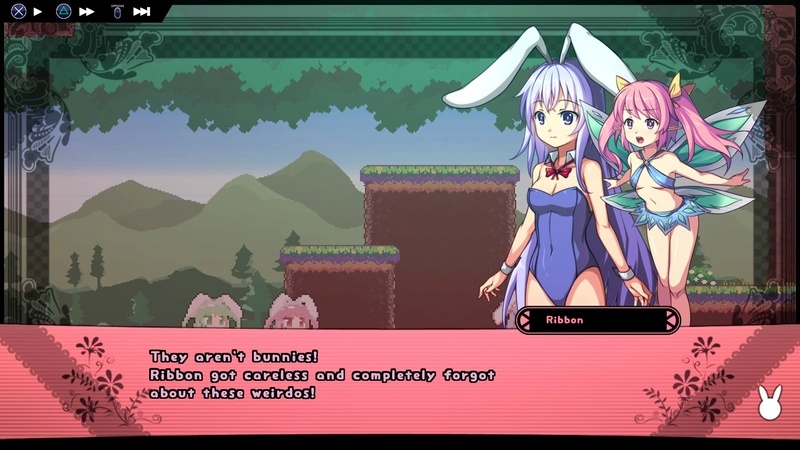 As Erin you are being chased and constantly harassed by these cosplaying bunny girls fanatics, bunnies have been extremely rare to people and have not been seen in months but when they see a bunny girl that’s a whole different story to them. After meeting your reuniting with your master the whole game opens up and you are tasked with figuring out what that mystic object in town does and how it ties into the game. However in order to activate the mystic object you need to bring people who have strong ties with magic into town to help research/activate it. Easier said than done and the crazy adventure begins. Listen to the fairy. There is no time to explain! Just shoot them! The graphics of this game is 2D Retro- Inspired Snes style with a lot of charm and cuteness added to it. In the game you will see a lot of cute enemies from small round jelly looking bunnies, bees, fish, nerf gun using cosplay bunny girl fanatics running around in bikini’s to girls hiding in barrels shooting lasers and a refrigerator. Things can get strange in this game. The animations for the characters are drawn really well. Many with the anime style animations just have that one pose. Despite that, they have nailed the retro style graphics well! 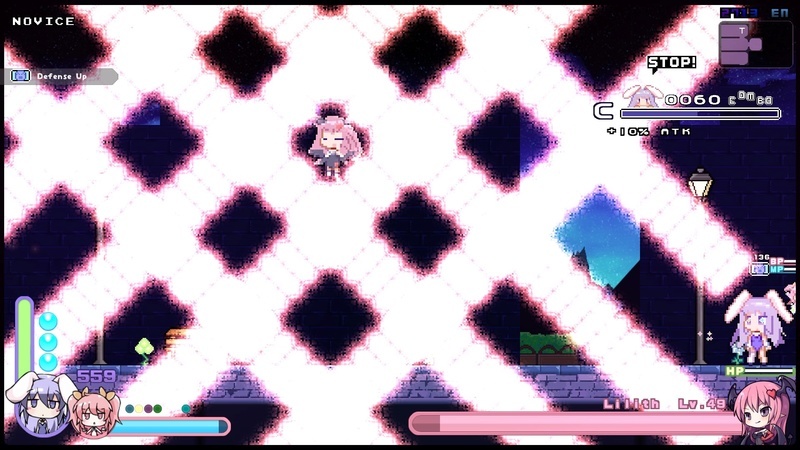 The gameplay is a 2D action bullet hell sidescroller platformer game. This is one crazy combination but it works so well! 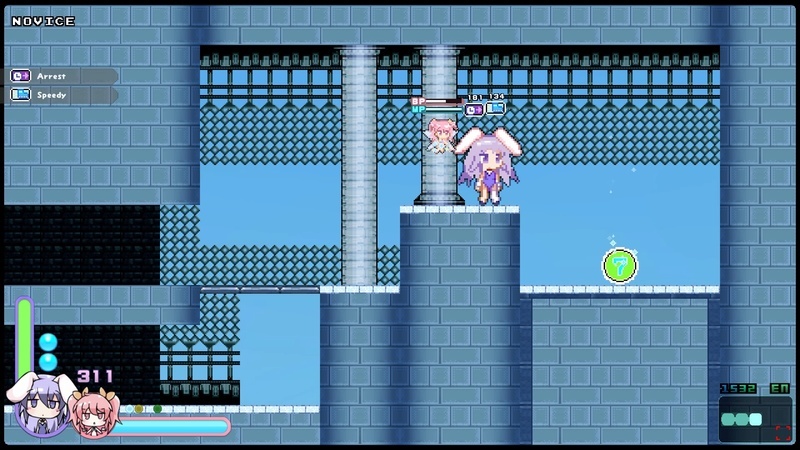 Throughout the game, you control both girls simultaneously. Erin who you will move around with, jump attack, pick up items and so on. Ribbon on the other hand functions as your projectile fire as she can equip quite a number of power magical items that change her projectile powers drastically she can also grant Erin power-ups for a short while in exchange for exhausting her BP gauge. 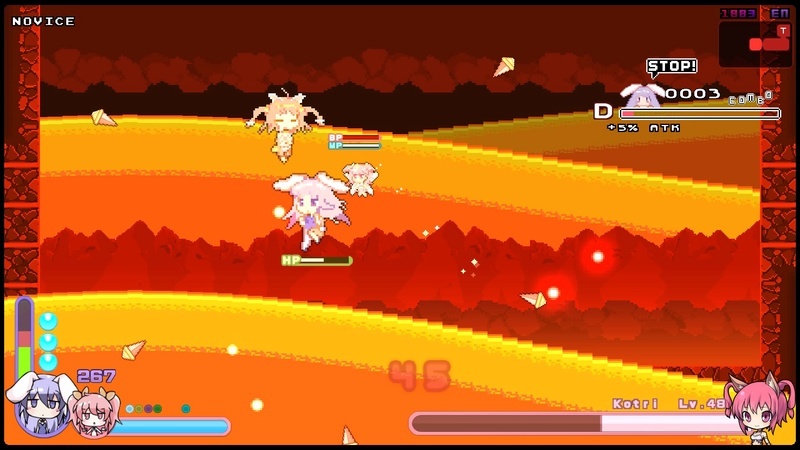 Erin’s main way of beating up enemies is with her Piko Hammer (Cute name for a weapon) however Erin and Ribbon can’t attack forever both girls have their own gauge that allows them to attack, each attack consumes the bar and once depleted you can’t attack, don’t worry the bar refills quickly. 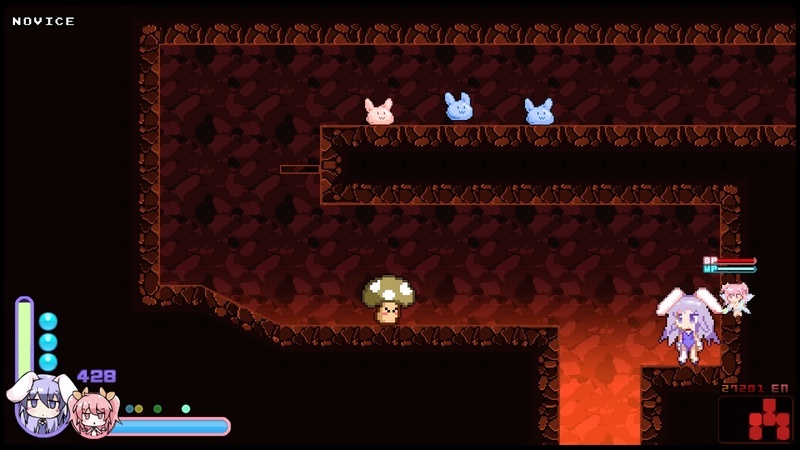 In this game, there is a lot of areas and ground to cover they have different routes, secret hidden places you can uncover by blowing up the breakable parts of the map with a carrot bomb or perhaps find completely new areas to find. There is a lot of things to discover including power-ups, new abilities for both Erin & Ribbon. It’s a really good idea to check a lot of old places when you discover a new ability especially that slide technique. Yeah, she's affordable now, just you wait. You're going to wish to have some coupons or a Walmart nearby! 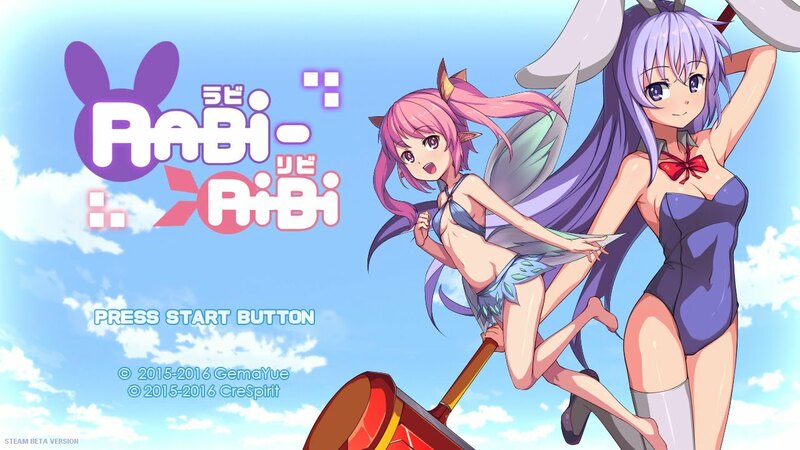 In the Rabi Rabi (Just adorable) town is where you can meet the NPCs who will help you out in your adventure. 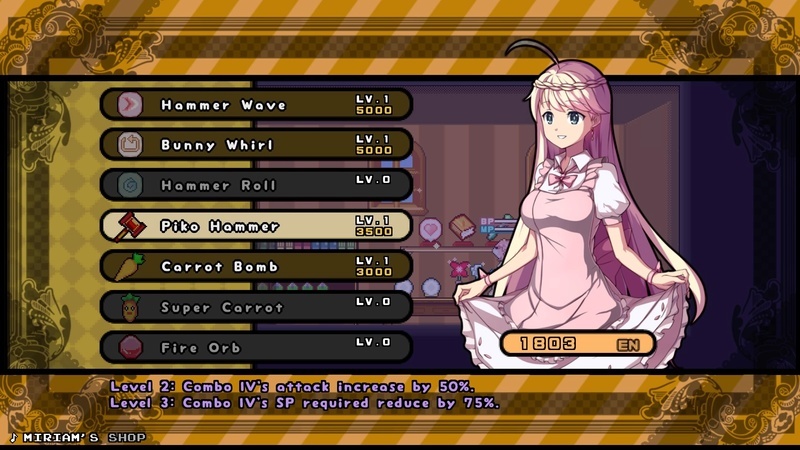 If you give them money they will power up Erin for a set amount of time and these little boost helps from super speed, more damage, a magical power that boost the defense of your casino bunny girl outfit. They also have a store that sells power-ups and abilities. In order to obtain currency in the game just beat up monster and find they grant you currency called En which you can only use in town. The boss battles are where things get really intense. This is where you will see a lot of the bullet hell feature come into play most here. These bosses do not fool around! The higher their level the more insane the attack patterns you will see. Once a boss health reaches around 25% of their max health they will use their ultimate attacks. When you see this animation an ultimate is coming. Oh look the ground is covered with lava and shooting me with bullets how lovely. It’s amazing! Each zone and boss fight has their own theme song. The soundtrack very heavily to which area you are currently, for example, the starting forest has a cool relaxing upbeat song, the pyramid has that Egyptian theme song, the computer base, and the hacking zone has really good techno/rave music. Each zone music fits very well with its surroundings. I myself love the underground hidden base zone theme and one of the boss battles that sounds like it came from Street Fighter Gil’s theme. The soundtrack of the game is just outstanding. I give this game a 10/10 This gem is just a fantastic game. If you are a lover of Megaman & Metroid this is the game you should pick up. The controls are very tight so there are no worries about missing your jumps of platforms or sliding all over the place. There are also many side bosses and a large variety of things to explore. There is also a postgame after the main story and a new game plus feature. I enjoyed this game immensely! You can not go wrong if you want an action platform adventure game with some challenge. Whoa, excellent review, new website reviewer! What an incredible review @PennSage! Thanks for writing this incredible review. Nice first PS4 review @pennsage. Awesome review! This might be one of the most detailed reviews on this site! What a lovely review sage. Now WiiWareWave can finally compete with Nintendo Life and Push Square again. @Reanfan is good, but his reviews are usually short so he can publish content more quickly. Once @ryoutak and @Pennsage joined the WiiWareWave crew Reanfan was able to focus a little more on details in his reviews. The next few months should be interesting around here! Nice review @Pennsage and kudos for publishing the first PS4 review on this website. Great review! This is now at the top of my wishlist thanks to your review! Your review is amazing @Pennsage! @GeekyGamerZack wrote: Whoa, excellent review, new website reviewer!